In 1994, nearly half a century after Independence, Mullaria village in Kerala's Kasargod district still had no access to electricity. In this, it was no different from two-thirds of India. Kerosene lanterns lit most homes in the village, darkening walls and blackening lungs. But Mullaria would usher in a quiet revolution, thanks to Handattu Harish Hande. An alumnus of IIT-Kharagpur, and a PhD in energy engineering from the University of Massachusetts (Lowell), Hande had devised a solar lighting system but was finding no takers for it. Arriving in Mullaria, he tried in vain to convince Arvind Rai, a local farmer, of its benefits. But the tenacious engineer refused to give up. One day, when Rai was away, Hande installed a solar lighting system in the house with the support of the farmer's mother. He did not take any payment and simply wanted the family to try out the system, which powered four lights. A week later, when Hande returned to the house, Rai gave him a warm welcome and settled the entire bill of Rs 12,000. Rai was Hande's first customer, but since then he has sold around 145,000 such systems to households, small businesses and community projects in Kerala, Karnataka and Gujarat. Most of them are in Karnataka, the state in which the 45-year-old Hande has settled down. He has proved that poor and rural folk are willing to invest in reasonably priced technology. 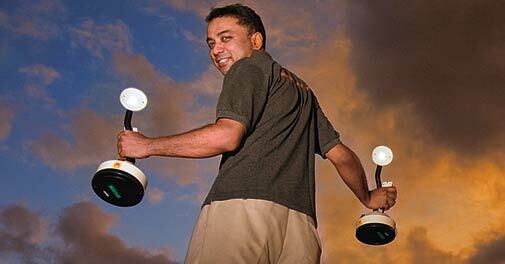 His achievements saw him pick up a Magsaysay Award in 2011. It was a visit to the Dominican Republic in 1991, and specifically his exposure to the work of Richard Hansen, which showed Hande how solar energy could transform the lives of the poor. While working on his doctorate, he travelled to the tiny Caribbean nation and saw for himself how Hansen, an American engineer who shifted there in 1984, had used solar energy to provide electricity to thousands of poor Dominicans. Hande decided to do something similar in his own corner of the world. Another inspiration was Neville Williams, a journalist and renewable energy champion, whom Hande met while at Massachusetts. It was along with Williams that Hande launched the Solar Electric Light Company (SELCO) in Bangalore, in 1995, soon after his solar lighting system began getting its first customers. SELCO has since grown steadily, earning profit after tax of Rs 72 lakh on a turnover of Rs 18.50 crore in 2011/12. Most of its customers come from low income groups. "The families we dealt with last year have a monthly income of between Rs 3,000 and Rs 4,000, and they bought systems that cost between Rs 8,000 and Rs 20,000," says Hande. SELCO's ownership today rests with three foreign non-profits: The Lemelson Foundation, Good Energies Foundation, and E+Co. Every staffer, including Hande, is an employee. The company has offices in Karnataka, Maharashtra, Kerala and Gujarat. The firm does not take out profits but reinvests in the business. Around 400 million people in India still have no access to electricity, according to government estimates. The Centre's goal of providing at least one unit of electricity a day to all homes by 2012 remains unmet. (One such unit or kilowatt hour would light a single 40-watt bulb for 24 hours.) "Many villages either have no power, or get scanty power. We visit such villages, explain our solar applications and arrange bank loans for interested buyers," says Guruprakash Shetty, SELCO's Area Manager for South Karnataka. A SELCO system consists of a panel, a battery and a charge regulator. It can power low wattage appliances such as lights, fans, television sets, mobile chargers and radios. The solar panel's batteries get charged during the day and store the energy - which enables the system to keep functioning for about 12 hours without being recharged. It is eco-friendly in other respects too: a system using, say, three solar lights cuts kerosene consumption by four to six litres a month and thereby reduces seven tonnes of carbon dioxide emission over 20 years, says a SELCO study. SELCO products, however, are not subsidised in any manner. There is no state support of any kind, though the government is the biggest beneficiary of SELCO's efforts. "We help reduce the state's kerosene subsidy bill by replacing kerosene lamps and stoves with solar-powered products," says Hande. "In return, the government taxes us at 30 per cent, while giving tax breaks to IT companies which earn millions." 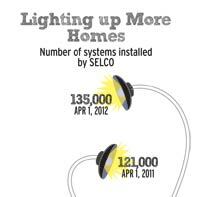 Not surprisingly, SELCO's lighting systems do not come cheap. Its most affordable offering, a single light system, for instance, costs Rs 7,500. "We run SELCO like a sustainable business. We keep a margin of 22 to 24 per cent," says Hande. While panels, batteries and other accessories are bought from various vendors, SELCO manufactures the solar lamps at its own facility in Mangalore. K. Subramanya, former Tata BP Solar CEO, says the company has been successful because of Hande's extensive effort at connecting banks with rural households. Often SELCO has had to stand guarantor for borrowers that banks felt were not credit-worthy. Another offshoot of its business is villagers opening bank accounts to save a part of their earnings. SELCO executives also help villagers find market linkages for their produce to enable them to repay the solar loans. Most rural borrowers repay. "Some eight per cent default, but most such cases are due to genuine reasons like crop failure," Hande says. K.M. Udupa, Chairman of Malaprabha Grameen Bank, was the first banker to extend such loans in India, introducing them in Dharwad, Karnataka, in 1995. He gave loans to 100 rural families. Udupa later joined SELCO's board. Today, even some areas that are connected to the grid use SELCO's lighting system as a backup, because of power outages. In Karnataka itself, for instance, rural areas are denied power for at least eight hours a day, on average. 7 tonnes: Reduction in CO2 emission over 20 years with one SELCO system of three lights"
"The best part about SELCO is its after-sales service. The team is available 24/7 to fix any problem, and its products come with long warranty periods," says L.H. Manjunath, Executive Director of Shri Kshetra Dharmasthala Rural Development Project (SKDRDP), a non-profit run by the Dharmasthala temple in Karnataka. SKDRDP first partnered with SELCO in 1999 to provide solar lamps to 1,000 homes in Karnataka's Belthangady taluk. 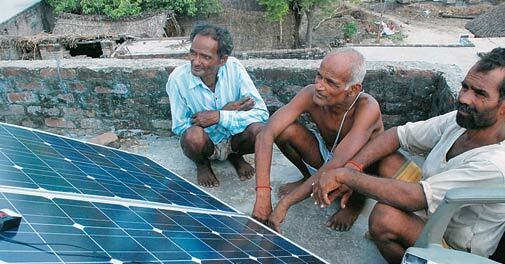 In 2012/13, they will provide solar lighting systems to 20,000 homes in 15 districts in Karnataka. The Dharmasthala temple itself uses SELCO's solar system to heat 100,000 litres of water a day at its lodging facilities. Customer interactions have often thrown up useful business insights for SELCO. For the last few years, for instance, SELCO has been supplying street vendors with solar lamps at a daily rental of Rs 10 to Rs 15 to wean them away from kerosene lamps. Potato sellers ask for lamps that beam yellow light because white light exposes black spots on the potatoes. Tomato sellers, on the other hand, want only white light because it makes the berries look brighter. Hande's success has inspired many others to enter the solar product market. ONergy, a Kolkata-based social enterprise in renewable energy, names him among its mentors. The 25-member ONergy team, active since 2009, has installed solar lighting systems in 3,000 households. "Our aim is to create 50 renewable energy hubs in East India in five years and educate villagers about the benefits of solar energy," says Vinay Jaju, Chief Operating Officer. The firm has five hubs now. Other companies, such as Duron Energy, Orb Energy and SunDeep Energy, also sell solar products for various applications. Hande, meanwhile, wants to reach out to still poorer people, work with the poorest of the poor. He wants 20 per cent of SELCO's turnover this year to come from families with a monthly income of Rs 3,000 or less. The company also has a non-profit arm, the SELCO Foundation, which has set up two 'labs'- in Ujire, Karnataka, and Ahmedabad, Gujarat - to identify the needs of the poor, suggest products and solutions, find companies to meet them, and recommend financial models that will enable the poor to afford them. By 2016, he wants to have six such innovation labs. "India can be the centre of innovation for the removal of poverty," he says. Simultaneously, Hande is pursuing the notion of seed-funding aspiring young entrepreneurs from rural India who have business ideas linked to fighting poverty. Says Subramanya, the former Tata BP Solar chief executive: "This country needs more men like him. We have barely scratched the surface in reaching solar applications to rural homes. Harish must spread out and influence the beginning of many more such initiatives." "The system we bought in 1994 is still in good shape," says Rai of Mullaria village. "We could even watch television with it." If he no longer uses it, it is only because his home began getting regular electric supply from the grid four years ago. Sarkari sasti hai, par aati nahi," says Ram Kumar Shukla, 48, referring to the power situation in Thigra, his village in Uttar Pradesh's Sitapur district. Indeed, while state-supplied power is cheap, Thigra, just 90 km from Lucknow, gets none of it - the village is not connected to the grid. Shukla and other villagers have been enjoying the benefits of electricity , thanks to Mera Gao Power (MGP) and its solar microgrids. MGP was set up in 2010 by Nikhil Jaisinghani and Brian Shaad, both from the US. To date, the company has given people in 35 villages in Sitapur district, including Thigra, access to electricity. MGP's microgrids are standalone devices. They consist of two solar panels of 120 volts each and two batteries that store power. Each microgrid generates enough electricity to power 35 households for seven hours. The power that is generated is supplied to household through cables and is sufficient to run low wattage appliances such as lights and mobile chargers. The villagers pay the company Rs 100 each month for their consumption. "Solar runs on its own. We don't want the HR and operational and maintenance costs that come with other modes of microgrid power," says Jaisinghani.